Five Southwest Virginia businesses are piloting a strategy to fund job-creating business expansions. Kiva, a nonprofit community-backed loan system, aggregates individual lenders from across the region and around the world to support loans of up to $10,000. 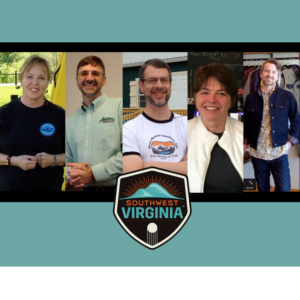 The businesses promoted the campaign on May 17 at the 2018 Southwest Virginia Economic Forum. “It’s the right size loan to help us prepare for what we expect is going to be our biggest season yet,” said Eva Beaule of Adventure Mendota from the stage of UVa-Wise’s David J. Prior Convocation Center. The Washington County businesswoman is planning to use a Kiva loan to purchase 25 additional kayaks. “Already this year we have group reservations for more people than we have equipment.” With two weeks left in the funding period, Eva has received pledges from 119 lenders totaling more than half of her $8,000 loan. To be nominated to participate in a Kiva loan strategy through local Kiva trustee Opportunity SWVA, the business owner must be working with a local business development resource such as the Small Business Development Center or an economic development authority, or have participated in a training program such as a business plan competition. Additionally, the business must be good for the community, creating jobs or helping to advance a community or regional economic strategy. Manufacturer and designer Stephen Curd will use a Kiva loan to pay for machines that will put additional employees to work. “I want to do my part to honor our manufacturing tradition. We can still make things, and I want to pay a decent wage to those who help me do it.” The retail shop of Garic Stephens and Lavelle Manufacturing is on the town square in Glade Spring. To date, more than 300 individual loans have been made to the five businesses who are collectively seeking $43,000 in expansion capital. 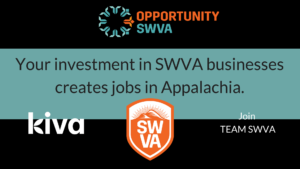 Opportunity SWVA encourages residents and supporters to join Kiva and become a SWVA Business Lender today. For more information, visit www.opportunityswva.org/kiva or contact Becki Joyce (276) 254-0419 or Andrew Barnes (276) 298-9726.